I found this dish through Maangchi, a Korean food YouTuber, and knew I had to try and make it. This recipe is my take on her’s, however I added a little vinegar for acidity and rice syrup for a sticky sweet finish that makes this tofu so addicting. Perfect served on its own for a quick snack, or with steamed vegetables and rice as a light meal, this recipe is (somewhat) healthy and very satisfying. I usually make it as a meatless meal during the week. The key is to fry the tofu until it creates a skin that is dry and crispy. Try to not flip it until it is ready – all you need to do is set it down and let it go. If you have a little time you can further dry the tofu out in advance by taking the block out of its packaging, wrapping it in a paper towel, and pressing it down with a weight (I like putting cans on top of a plate) for 20 minutes. Step 1: Drain and pat the tofu dry with a paper towel. Cut into 1 cm thick blocks. Step 2: Heat frying pan on medium high. Add frying oil. When oil is hot (you can test by sprinkling water on the pan – it’s ready when the water sizzles immediately upon contact) add tofu in single layer and shake pan to distribute the cooking oil under the tofu. Step 3: Cook the tofu for about 10 minutes. Try not to flip them until they start to develop a crispy skin. Check the tofu on the sides and middle of the pan and make sure all pieces are cooking evenly. Reduce heat if needed if tofu is starting to burn. When all pieces are evenly toasted and golden brown on one side, flip them and cook the other side. Step 4: While the tofu is cooking, make the sauce. Start with the gochujang and gradually thin it out with the sake. Add the soy sauce, sesame oil, rice syrup, and vinegar. Step 5: When both sides of the tofu are crispy and golden brown, add the sauce. Reduce the sauce for a couple minutes while coating it on the tofu. When the sauce is thick and syrupy, everything is ready. Step 6: Serve warm, sprinkled with sesame seeds and chopped green onion. Sometimes you need something simple, yet satisfying. This is one of those dishes. A perfect recipe for spring, this dish is light and refreshing. The key ingredient is canned tuna stored in olive oil, which gives this recipe a beautiful saltiness that makes this dish so easy to devour. Hopefully the idea of canned tuna doesn’t scare anyone off, but I promise, this is much more elevated than the tuna salad or casserole that gave it the bad reputation. The key here is that it is stored in olive oil, not water. This olive oil adds depth of flavor and acts as a perfect host to the pile of garlic that I added to give some savory to this dish. To balance out the saltiness, I included fresh cherry tomatoes for their acidity and brightness. They are added right before serving so that they warm up enough to just slightly burst, making every bite juicy and tinge sweet. Step 1: Heat enough water to cook the pasta, add a teaspoon of salt. When boiling, add pasta and cook until al dente. Step 2: Heat 3 tbs olive oil in a frying pan on medium high heat. Add garlic, and cook until they start to crisp up and become golden. Step 3: Add the tuna and any leftover olive oil from the can. Break into bite-size pieces and cook for 3 minutes. Add the dried oregano, red pepper flakes, and salt to taste. Stir to combine. Step 4: Add the tomatoes. Cook until they start to blister and burst open, about 5 minutes. Crush half the tomatoes so they release their juice. Stir in the reserved pasta water to make a sauce. Step 5: Add the pasta and coat everything with the sauce. Drizzle with olive oil, and it’s ready to serve. Falls apart on the fork. Step 1: Heat oil in dutch oven (or heavy bottomed pan) on medium-high. When sizzling hot, add the garlic and beef. 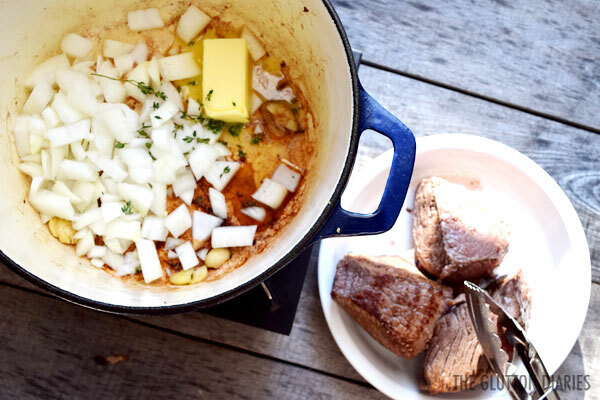 Watch garlic to make sure it does not burn and sear beef on all sides until browned and crusty. Remove meat from pan and set aside. Step 2: Reduce heat to medium and heat butter in same pan you cooked the meat in. When fully melted, add the onion and thyme to the fried garlic. Cook until onions are browned. While cooking, make sure to scrape the bottom of the pan with a spatula to loosen any leftover meaty bits from searing the beef. Add the carrots. Step 3: Pour beer over onion and carrots, use the liquid to loosen any caramelization that may have built up on the base of the pan while cooking. Move the vegetables in the pan around to make room for the meat. Add the meat back to the pan and top with the radishes. Step 4: Pour 3/4 of the broth over the radishes and beef. Season with a sprinkling of salt and pepper. Cover pot and cook on low for 3 hours. Check periodically to see the amount of liquid in the pot. if it is starting to look low, add remaining broth or water. You always want the meat to be submerged in liquid. Step 5: After 3 hours, check on the meat. It should be tender enough that you can start to break the meat apart with a fork. It should not be so soft that it is falling apart. If it is ready, add the tomatoes, green onion and honey. Test broth for seasoning and add salt and pepper to taste. Add more broth/water if need be, only if the liquid isn’t covering the majority of the meat, and cover pot. Cook on low for another 30 minutes to an hour. Step 6: Meat is ready when it falls apart with little effort from a fork or tongs. When the weather gets cold, my favorite weekend activity is baking a good loaf of bread. There is something about the smell of bread baking – the air is tinged with this light, yeasty smell, and because the oven is on, the room gets toasty. Lastly, cutting into a steaming, freshly baked loaf of bread is the best reward to a day of baking. 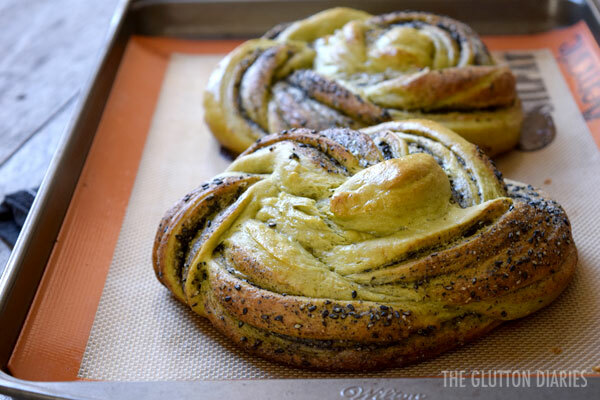 While more time consuming compared to other baked goods like cakes or cookies, bread is not hard or intimidating to make (even though it can seem like it is). The majority of your time will be spent allowing the dough to rise, and if you are like me, you can spend that time with a good cup of coffee and an episode or two of Friends. 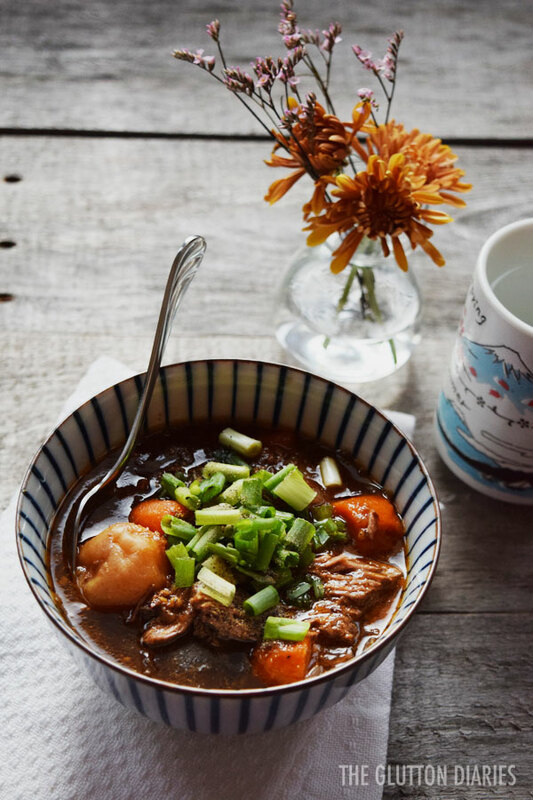 This specific recipe has an Asian influence, and has a slight sweetness. This is definitely not a dessert bread, as I didn’t want this to feel like cake. However when toasted, this is an awesome option for breakfast with when spread with some softened butter and honey. Yeast works best in a warm, somewhat humid environment. So this recipe is actually way easier to make in the summer for me since my kitchen will naturally be on the warm side. However, when the weather is cool, you can easily fake this environment by preheating your oven, turning it off, and allowing it to cool to a mild warmness. If you can stick your hand in it and not feel like you will be burned, the oven is ready. Simply pop the dough in, and let the yeast do it’s work. Aside from your kitchen environment, the key to the success of this recipe is in activating the yeast before you even touch the flour. Many recipes I come across do not treat yeast properly. First of all, yeast is what causes this bread to be fluffy. Without activating it, you might as well not use it. Which is why it is so important to mix the yeast in warm liquid like I do in the first step. You know it’s good to go if there is a bit of a frothy texture on the top of the liquid after 5 minutes. That means the yeast is active and energetic. From there, you are good to go! Step 1: Warm milk and water in microwave until lukewarm. It’s ready when it feels like warm bath water. Stir in yeast. Set aside 5 minutes to activate. Step 2: Mix flour, sugar, salt and matcha in a bowl. Add yeast mixture, stir, and then the butter. Stir until combined. Turn onto a lightly floured work surface and knead 5 minutes until smooth and elastic. If you poke the dough with your finger, it should slowly bounce back. Step 3: Place dough in an oiled bowl. Cover bowl with oiled plastic wrap. Make sure the plastic leaves plenty of room for the dough to rise. Cover plastic wrap with a damp towel and raise for an hour or until doubled in size. Step 4: Mix ground sesame with remaining sugar, set aside. When dough is fully risen, punch gas out of dough. Step 5: On lightly floured surface, press dough into a large rectangle. You want the dough to be about a centimeter thick. 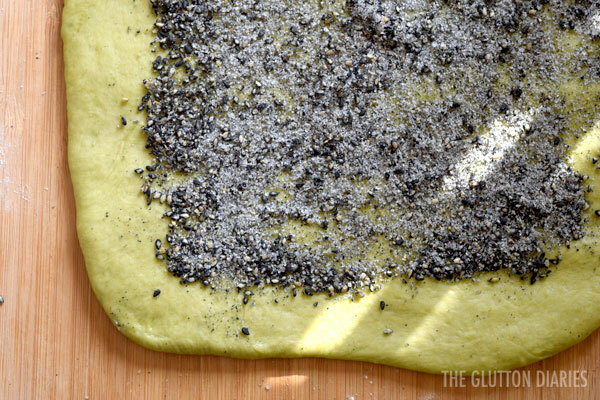 Spread sesame mix over dough, leaving an inch of space on one of the longer edges of the rectangle. Roll dough into a log, moving towards the empty inch with the dough. This clean area of the dough will help seal the edges together. When fully rolled, pinch edges of dough together to create a seam. Step 6: With a large knife, cut into the log. Leave one end intact. This will create a large, long V-shape. Take the two ends and start twisting them together. When fully twisted, pinch the edges together to keep the log intact, and then start rolling the log into it’s self to create a rosette. When the bread is fully wrapped together, pinch all end seams together to keep the ball uniform. Transfer onto a baking sheet lined with parchment paper. Step 7: Dab the egg wash onto the clean parts of the dough’s surface, making sure to leave the sesame undisturbed. Cover with plastic wrap and towel and rise another hour. Step 8: Preheat oven to 375 degrees Fahrenheit. In the mean time, baste bread again with egg wash. When oven is ready, place bread in oven and bake 25-30 minutes. *If bread browns too fast while baking, cover top with foil. *Tip for proofing bread: to help yeast work efficiently, let bread rest in a warm place. Preheat oven to 200 degrees, but then turn off heat a few minutes into pre-heating. The heat is right if it feels mildly warm, but not enough to make your hand sweat or burn you. After a long hiatus, I am back! With it officially fall, I wanted to try making something with sweet potato. However, instead of going the more traditional route with warm spices like cinnamon, I wanted to give the sweet potato a little Asian treatment. Step 1: Place the sweet potato in a microwave-safe bowl, wrap with plastic wrap, and then cook on high until soft (about 4 min). Place cooked sweet potato in food processor (or mash with a fork vigorously) with the sugar. Grind into a smooth paste. Step 2: Let the potato cool down fully and then roll into 1 inch-sized balls. Cover with plastic wrap. Step 3: In another bowl, pour and mix the water into the rice flour in increments. This will prevent you from creating lumps. When everything is fully combined, cover the bowl in plastic wrap, and microwave for one minute. Step 4: When the rice flour mixture is fully cooked, it will be elastic and translucent. Using a mixing spoon, stir the dough to give it more elasticity. You want to have a strong arm with this and pound it for at least a minute. Then, while the mix is still warm and pliable, scrape the bowl and transfer the dough onto a corn starch dusted cutting board. Step 5: Cut the dough into an equal amount of pieces to the sweet potato. (You will yield around 10 pieces.) Dust each piece with corn starch and then keep any unused dough covered with plastic wrap as the it dries out easily. Step 6: Take one of the pieces and dust off any excess corn starch. Using your fingers, pinch and pull the dough until it is just shy of the size of your palm. Place a sweet potato ball in the middle. 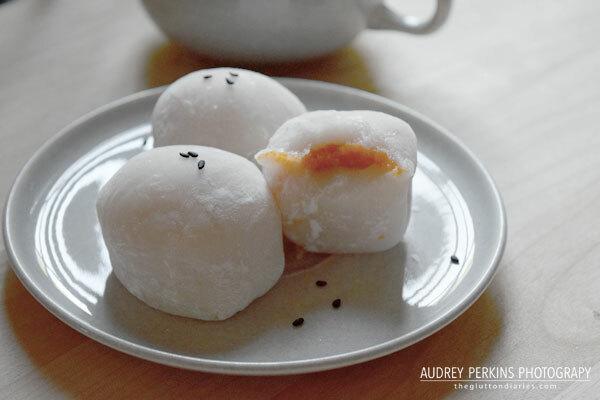 Pull at the corners of the rice dough and start to push the dough around the ball until everything is fully covered. Pinch the dough ends together to create a seam. Step 7: When the mochi ball is fully sealed, flip it over, and shape it nicely with your hands so it is even and round. Cover with plastic wrap and then repeat step 6 until you have completed the batch. Store in an airtight container. So it has been a long while since I have posted. Life caught up with me in the form of a move, work, and a few freelance assignments. However I am back again with some cool posts that I have built up in this break! Let me tell you why I decided to make this recipe. For me, cooking has always been a stress reliever. This is especially the case when the recipe involves repetitive motion. Focusing all my energy on only one repeating task is a great way to get out of my head and mentally decompress. Dumplings are a great example of this. Aside from the initial mixing of the meat filling, most of the work only involves three steps. Fill, dampen the dough, and pinch everything together. You just repeat these steps until you run out of filling. At the end, you have this beautiful plate full of dumplings that are ready to boil. Call me Type A, but having this nicely arranged plate (usually in a spiral shape) is a very relaxing site to see at the end of a hectic day. Also, this is such a comforting food to eat. Think about it. Warm, soothing chicken broth. A slightly chewy filling with a hint of ginger. Tender dumpling dough. All of these are quite comforting things. This is also a very light recipe, so you won’t feel weighed down after eating it. Step 1: Let’s make the meat filling. Combine the ground turkey, ginger, green onion, egg and salt and pepper in a bowl. Mix until homogenous. 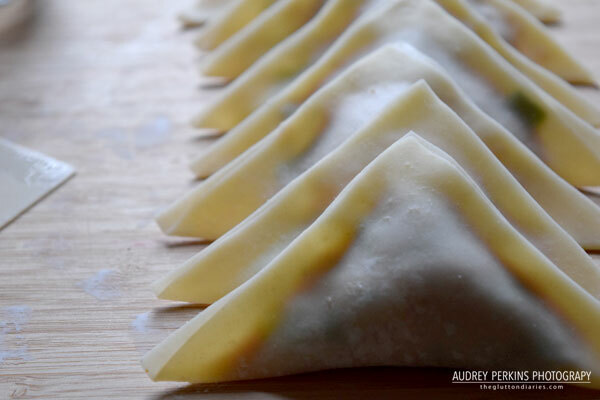 Step 2: Open dumpling wrappers. (Tip, keep a damp towel over your extra wrappers to keep them from drying out while you work. I usually isolate groups of 20 wrappers at a time.) Take one wrapper and dampen half of the edge. Step 3: Take a teaspoon of meat filling and drop it in the middle of the wrapper. Lift the dry half of the wrapper and press it into the damp side. 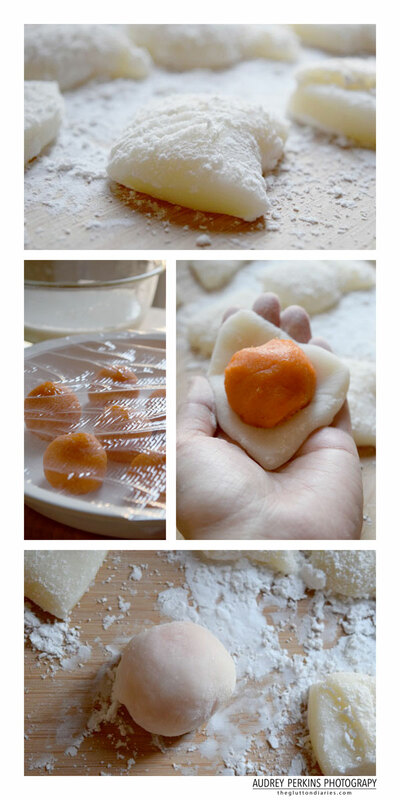 Before you completely seal the edges together, lightly press any excess air out of the dumpling. (This prevents them from floating to the top of the pan prematurely. Step 4: Fill and fold all of your dumplings together until you run out of meat. 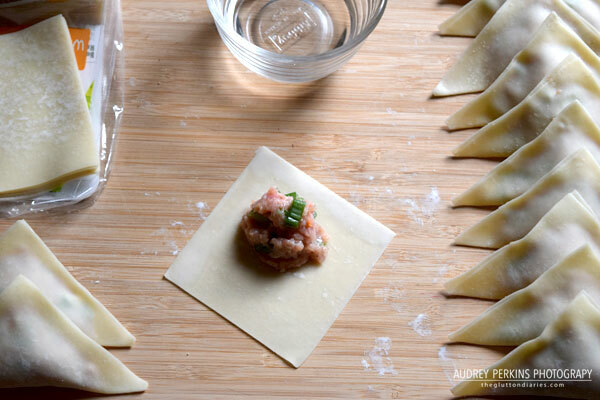 As you fill plates with your raw dumplings, cover the dumplings with plastic wrap to prevent the dumpling skin from drying out. Step 5: Boil water in a large saucepan. When it’s a rolling boil, place 10-15 dumplings into the pot. Be sure to not overcrowd the pot. Stir the water while dropping the dumplings to prevent them from sticking to the bottom of the pan. Boil for 5-7 minutes. Break one dumpling in half after cooking and check to see if the meat is white. If it is still pink, continue cooking another 1-2 minutes. Step 6: When fully cooked, drain and transfer dumplings to an oiled dish. 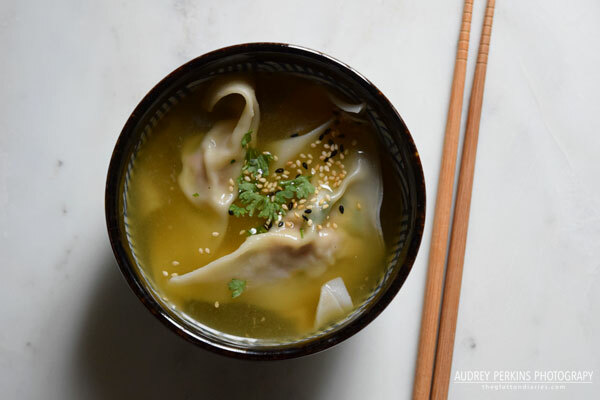 Swirl the dumplings in the sesame oil to keep them from sticking together. Repeat step 5 as necessary. Serve warm with chicken broth.